Exchange EDB to MSG converter is a breakthrough software which is made with great technology and amazing solutions. It converts all the Exchange EDB mailboxes to MSG file format. There is no need for live Exchange Server environment on the migration computer system. Converts multiple emails from the Exchange EDB file to MSG format. Recovery of corrupted Exchange EDB file and then conversion of that file is supported. Supports two EDB file recovery mode i.e. Quick and Advance scanning. Recovers both Priv.edb and Pub.edb files of the Exchange Server. Export unlimited number of Exchange EDB file as there is no file size limitation. Using EDB to MSG converter software the users can recover the Exchange EDB files with either of the two recovery modes. First, Recover Exchange Server Private Store database file(Mailboxes) and second, Recover Exchange Server Public Store database file(Public Store File). Users can convert multiple emails contained in the Exchange EDB file. The tool automatically saves each MSG file with the subject line of the emails and creates the folder for each item which is present in the mailbox. Plus, it keeps the metadata intact with the included attachments. In a case of the corrupted Exchange EDB file getting severely corrupted then the user should select Advance Scanning option. It will help the user in recovering the data from the damaged EDB file and export its emails into MSG file format. The quick scanning of the corrupted EDB file is performed by default. 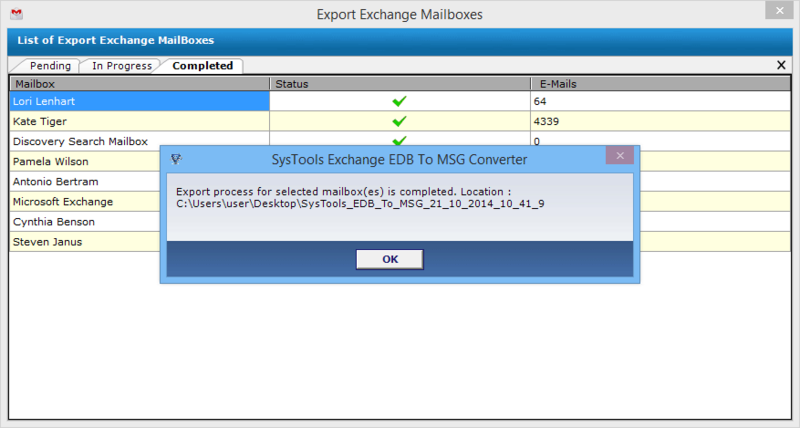 The Exchange Mailbox to MSG converter will scan and load the mailboxes which are there within the Exchange EDB file. Users can open each mailbox and view all the items contained in it. Also, the user can preview the content of each component like emails, calendars, contacts, notes etc. with their attributes. 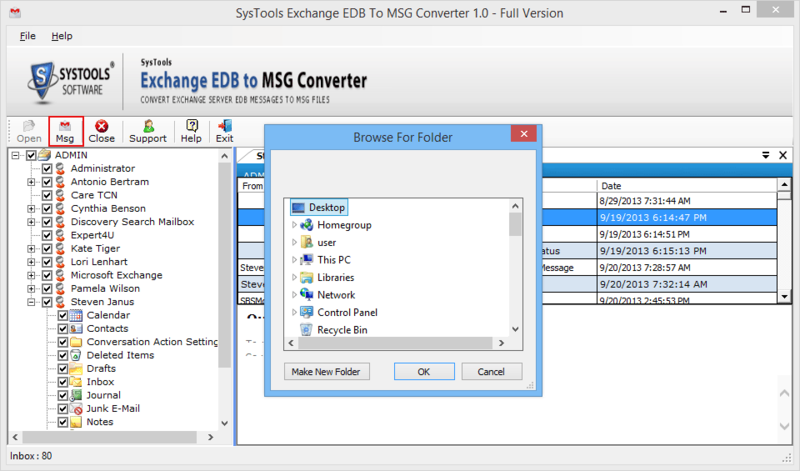 EDB to MSG converter provides the direct option which exports all the items contained in the Exchange EDB file into MSG file format. 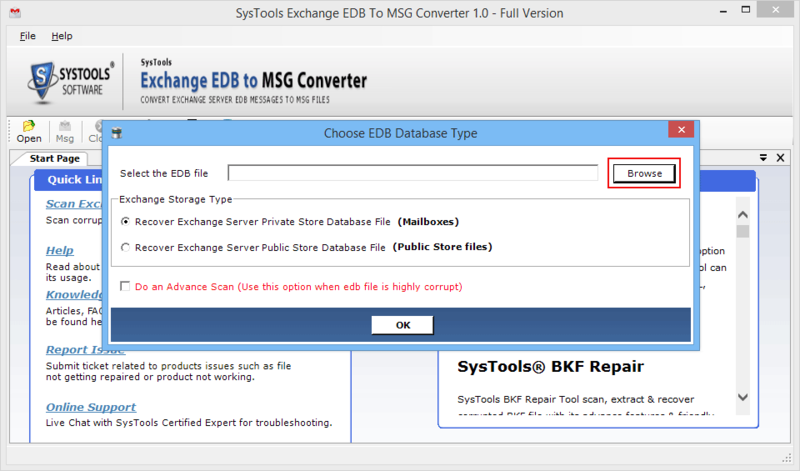 Users can also check or uncheck the items and then export the selected items from the Exchange EDB file to MSG. 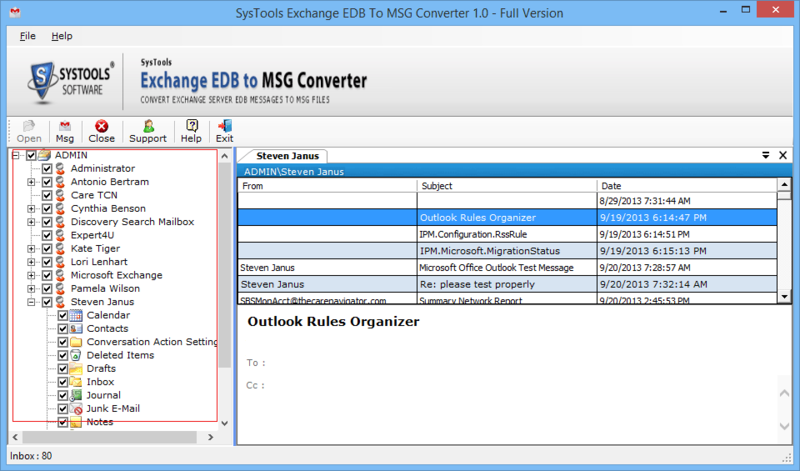 Once the conversion of Exchange EDB file to MSG begins the Exchange EDB to Outlook MSG converter software shows the number of files which are being converted from each mailbox. Users can view the progress using three tabs i.e. In Process, Selected and Completed mailboxes. Q. Will this software export the attachments of the emails? Yes, the software will export all the attachments which are contained in the Exchange EDB file. Q. Is the Outlook installation is required on the export machine? No, you can export the EDB file to MSG format easily without installing the MS Outlook on the export machine. The MS Outlook is necessary to view the files which are converted to MSG file format. Q. Will this EDB to MSG Converter software able to handle the large size Exchange EDB file? Yes, there is no file size limitation imposed by the software. Any size of EDB file can be converted to MSG file format. Q. Can this software convert multiple Exchange EDB files at once? 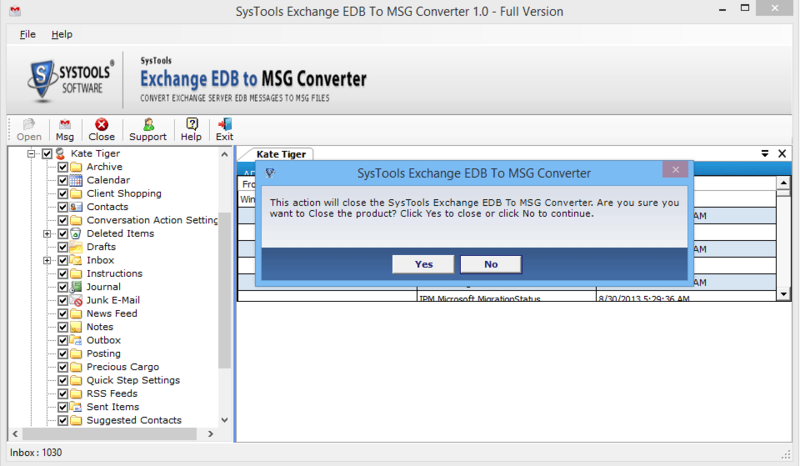 No, the Exchange EDB to MSG converter tool cannot convert multiple EDB files at once. But it can convert multiple emails contained in the EDB file. 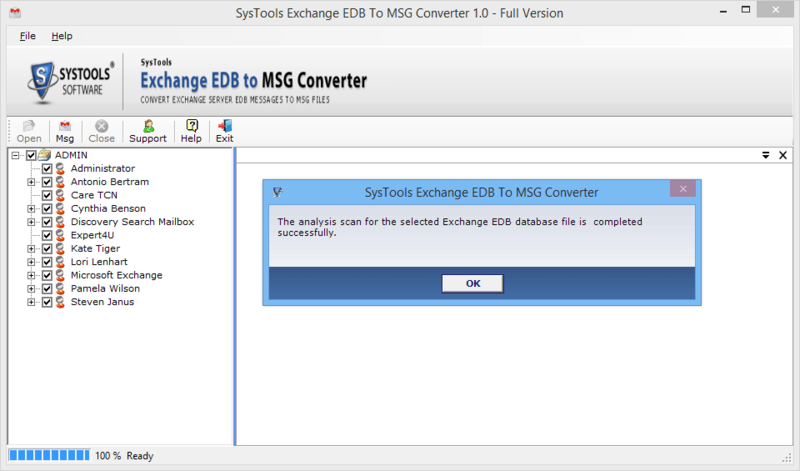 How to Convert Exchange EDB File to MSG? 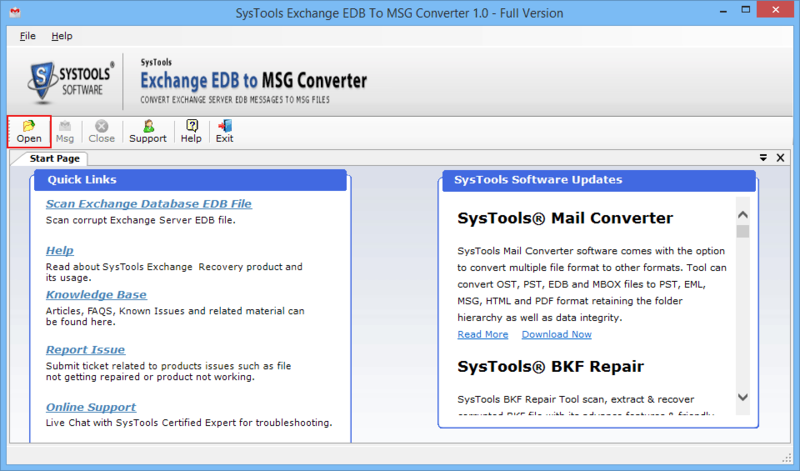 Step 1 : Download, Install and Run the Exchange EDB to MSG converter software on the system. Step 2 : Now select the Open option and the screen with Browse EDB file option to select the EDB file to be loaded with the software. The user can select the advance scan option in the case when EDB file is very highly corrupted, and click OK option. Step 4 : Once the scanning process has been completed user will get the message for successful completion. Step 5 : Now from the screen with Exchange mailbox users will be displayed in the left pane, click on each user in order to view the details, check or uncheck users and folders to go forward with exporting the exchange EDB files to MSG. Step 6 : After that select the MSG option from the screen and select the desired folder to save the files which are converted into MSG file format and click on OK. 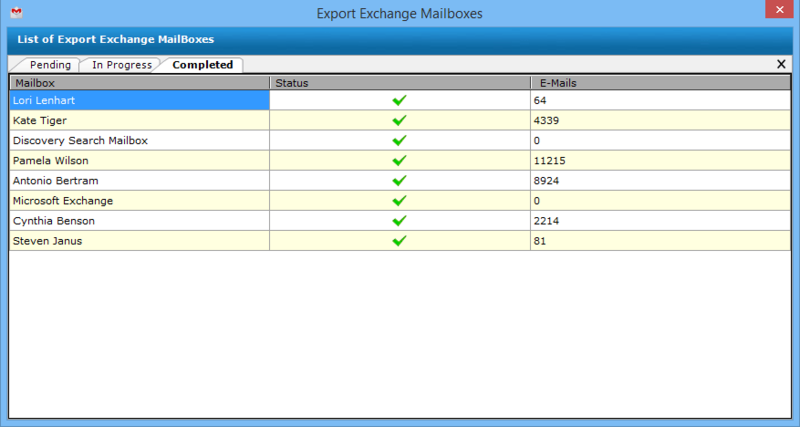 Step 7 : The NextScreen will show the status report of Exported Exchange Mailboxes. Step 8 : Now the user must confirm the successful completion of an export process with confirmation message and information of the path of the location where MSG file is stored. Click OK option. Step 10 : For stopping the software from working the main window should be closed and accept Yes option once the warning message is received for closing the application. I had always thought of working with an Exchange product but it always gave me the feeling of it being a very difficult experience. But the great user-friendly graphical user interface of Exchange EDB to MSG Converter software has really helped me a lot in the conversion process. Thanks for such an amazing software. We had the Exchange EDB files which consisted of a multiple number of folders. The Exchange Emails to MSG Converter software took less amount of time to working on those folders. The greatest part out all was that the results where the folder structure was properly maintained by the software.